Accordingly Ghatotkacha proceeds and kills Alayudha and others. He then confronts Karna and after a fierce fight disappears into the skies and engages in a deceptive war. This creates a havoc in the kaurava ranks and battle field is filled with cries of despair. Hearing this, Karna uses a very powerful astra known as Vijayanthi and Ghatotkacha is struck and falls from the sky and dies. This news saddens Bheema and Yudhisthira. While they and the rest of pandavas are sad, surprisingly Krishna looks happy and roars like a lion and embraces Arjuna! Arjuna is perplexed and asks Krishna to explain. Krishna tells Arjuna, 'It is an extremely good news Arjuna. I am a very relieved person. As Karna has expended his power against Ghatotkacha, take it that he is dead! Fortunately for us, his कवच armour and his कुण्डल ear-ring were given away earlier, now his special powers are gone. If these three things were still with him he could have won the three worlds easily. By giving up the first two to Indra in exchange for the special powers, he had assumed that he could easily kill you. Now you are safe as he is just an ordinary human being. It is now possible to defeat and kill him'. Soon the fighting stops and the army is able to rest. We now see how far a friendship can go! Krishna knowingly sends Ghatotkacha to his death to save his friend Arjuna, thus pandavas. It could be because Ghatotkacha is just a half-pandava and in reality more of a rakshasa. The other versions are different. Bheema invites Ghatotkacha to join pandavas as some rakshasas with old enmities towards pandavas join Duryodhana and pandavas need him to counter their ability to wage a 'Maya yuddha'. When Ghatotkacha creates a havoc with the kaurava army by becoming invisible and waging war from the skies, it is Duryodhana who requests Karna to do something or the entire kaurava army would be demolished. Whatever the reason, it is Krishna who realises the significance of Karna using his most powerful astra to kill Ghatotkacha. Karna has nothing more left to defeat Arjuna after using up this astra to save the kaurava army. Who or what are rakshasas? Tara remembered seeing panadava temples in Yogyakarta in Indonesia. 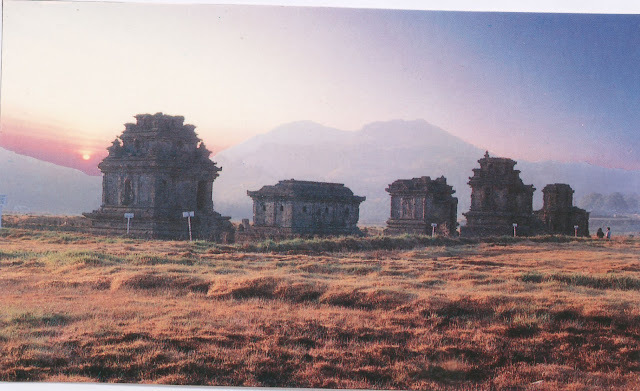 Sites of temples in Dieng can be grouped into four parts, namely the First Pandava temple as a place of worship Arjuna temple, Heroine temple, Puntodewo temple, Sembrada temple, and Semar temple. The second group Ghatotkacha Temple. The third group of Bhima temple. There is also a mention of a monument in Bali. The war between Ghatotkacha and Karna. Somewhat like chess where one has to sacrifice powers to win eventually. Actually Karna stiil has the brahmastra . However, that is useless as Prasurama's curse makes him forget the 'operating instructions' at the nick of the time.